You may be interested in purchasing a vinyl wrap for your vehicle. However, you may be a novice to vinyl decals. To help, here are the answers to six common questions about vinyl wraps. 1. What Is a Car Wrap? First, to know what a car wrap is, you should know what the term “wrap” means in general. In this context, a wrap refers to a kind of vinyl decor. In specific, it is a cut vinyl decal. This decal is then placed around another object. The wrap is form-fitting and should appear as the skin of what it is placed around. These cut vinyl decals can be used to create airplane wraps and building wraps. However, they most commonly take the form of car wraps. 2. How Is a Vehicle Wrap Made? Typically, a vehicle wrap is completed in three different stages. A car wrapping Denver specialist is ideal for the creation and installation. The first stage comprises the designing of the wrap. This will involve taking very intricate measurements of the vehicle to be wrapped. It will also involve the creation of the exact design of the vehicle graphics that will appear on the cover. Second is the production stage. During this stage, the cover is actually created. The vehicle graphics will then be placed on the wrap. The wrap will then be laminated for extra durability. The last stage is the installation of the cover onto the car. 3. 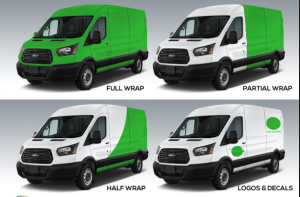 What Is the Difference Between a Full Wrap and a Partial Wrap? Full wraps and partial wraps are two terms you are likely to see while shopping for car wraps. A full wrap, as its name suggests, covers an entire vehicle. Car wrapping Denver specialists are most definitely needed for full car wraps. Any wrap that covers less than that is known as a partial cover. For example, a half partial cover is vinyl decor that only covers up to half of a vehicle from the rear. 4. How Long Will a Vinyl Car Wrap Last? One of the great things about vinyl wraps is they have a very significant life span. A good quality wrap should be able to remain on a car anywhere from one year to six years. How long a cover lasts also depends on certain variables. What these variables are should be explained to you by the vinyl cover dealer you do business with. Usually, though, a wrap created with long life solvent ink as well as an over-laminate with ultra violet ray protection should last at least three years if not more. 5. Will an Auto Wrap Damage a Car’s Paint Job? Some people may worry that a cover could damage a car or truck’s paint job. Thankfully, this is usually not the case. This is especially the case for factory paint jobs. However, different variables may come into play. It is always a good idea to discuss this with your vinyl graphics dealer. 6. Can Auto Wraps Be Repaired? Some people may be worried about investing in a vehicle cover due to the possibility that the cover could become damaged. If this does occur, the damaged area can certainly be repaired without replacing the entire wrap.